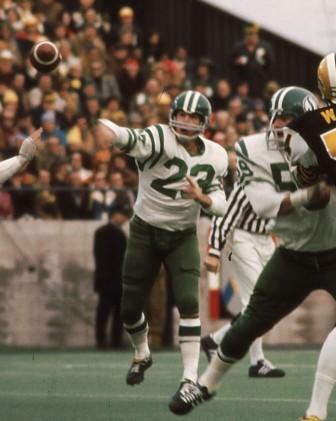 Ron Lancaster quarterbacked the Saskatchewan Roughriders to five Grey Cup finals, including their first championship in 1966. Lancaster received the Jeff Nicklin Memorial Trophy, awarded to the Western Conference Most Valuable Player, on five occasions. During 19 seasons, Lancaster completed 3,384 passes for 50,535 yards and 333 touchdowns. He was the Canadian Football League’s passing yards leader in 1970, 1973, 1975, 1976 and 1977. Ron Lancaster is a member of the Saskatchewan Sports Hall of Fame and Canada Sports Hall of Fame.